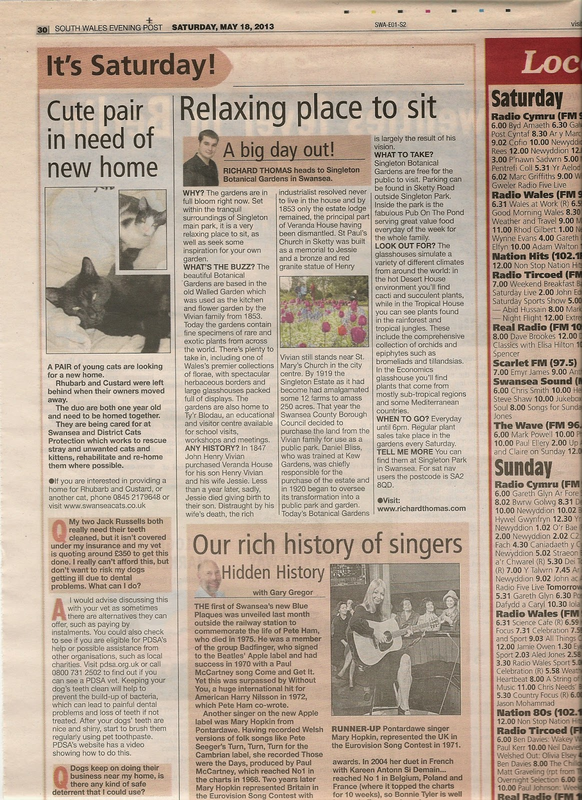 Below is my “Big Day Out” column from the Saturday, May 18, 2013, Swansea edition of the South Wales Evening Post. RICHARD THOMAS heads to Singleton Botanical Gardens in Swansea. WHY? The gardens are in full bloom right now. Set within the tranquil surroundings of Singleton main park, it is a very relaxing place to sit and relax, as well as seek some inspiration for your own garden. WHAT’S THE BUZZ? The beautiful Botanical Gardens are based in the old Walled Garden which was used as the kitchen and flower garden by the Vivian family from 1853. Today the gardens contain fine specimens of rare and exotic plants from across the world. There’s plenty to take in, the Botanical Gardens house one of Wales' premier collections of florae, with spectacular herbaceous borders and large glasshouses packed full of displays. The gardens are also home to Ty'r Blodau, an educational and visitor centre available for school visits, workshops and meetings. ANY HISTORY? In 1847 John Henry Vivian purchased Veranda House for his son Henry Vivian and his wife Jessie. Less than a year later, sadly, Jessie died giving birth to their son. Distraught by his wife’s death, the rich industrialist resolved never to live in the house and by 1853 only the estate lodge remained, the principal part of Veranda House having been dismantled. St Paul's Church in Sketty was built as a memorial to Jessie and a bronze and red granite statue of Henry Vivian still stands near St. Mary’s Church in the city centre. By 1919 the Singleton Estate as it had become had amalgamated some 12 farms to amass 250 acres. That year the Swansea County Borough Council decided to purchase the land from the Vivian family for use as a public park. Daniel Bliss, who was trained at Kew Gardens, was chiefly responsible for the purchase of the estate and in 1920 began to oversee its transformation into a public park and garden. Today’s Botanical Gardens is largely the result of his vision. WHAT TO TAKE? Singleton Botanical Gardens are free for the public to visit. Parking can be found on Sketty Road outside Singleton Park. Inside the park is the fabulous Pub On The Pond serving great value food everyday of the week for the whole family. LOOK OUT FOR? The glasshouses simulate a variety of different climates from around the world: in the hot Desert House environment you'll find cacti and succulent plants, while in the Tropical House you can see plants found in the rain forest and tropical jungles. These include the comprehensive collection of orchids and epiphytes such as bromeliads and tillandsias. In the Economics glasshouse you’ll find plants that come from mostly sub-tropical regions and some Mediterranean countries, and that are of economic importance, including sugar cane, coconuts, olives and coffee. This glasshouse also contains a colourful collection of begonias. WHEN TO GO? The gardens are open everyday until 6pm. Regular plant sales take place in the gardens every Saturday. 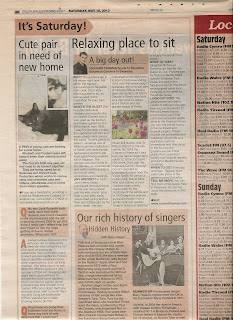 TELL ME MORE: You can find them at Singleton Park in Swansea. For sat nav users the postcode is SA2 8QD. Phone 01792 298637. My column for the May 2013 issue of Swansea Life magazine. ON LOCATION: Tenpin Swansea, formerly Megabowl, is the only ten pin bowling alley in Swansea, located in the Parc Tawe shopping and leisure complex near the city centre. Tenpin Swansea offers a host of family friendly activities for people of all abilities, from first time players right up to veteran bowlers. The alley boasts 26 bowling lanes, three American pool tables, an amusements arcade and cosmic bowling nights. For sat nav users the address and postcode is Parc Tawe, The Strand, Swansea, SA1 2AX. Phone 0871 873 3150. OPENING HOURS: The bowling alley is open 11am to 12am on weekdays and 10am to 12am on weekends. During the school holidays they are open 10am to 12am seven days a week. The bar closes at 11.30pm. CROWD SCENE: All ages are welcome at the bowling alley. BACKSTORY: Bowling is one of the oldest sports still played today. The earliest forms of bowling can be traced back to Ancient Egypt. In 1930 when the Egyptologist Sir Flinders Petrie excavated the grave of an Egyptian boy dating to 3200 BC he found artefacts resembling the pins used in tenpin bowling today. NOTEWORTHY: As well as normal ten pin bowling on some nights you can play cosmic bowling, a hybrid of glow-in-the-dark ten pin bowling with dance club music and lights. Up to date information about cosmic bowling times can be found at www.tenpin.co.uk/swansea. WHAT TO TAKE? One game costs £6.99 per adult and £5.49 each for juniors. You can also play two games for £12.25 (adults) and £9.75 (juniors), and three games for £13.75 (adults) and £11.25 (juniors). There’s also special family deals available. A family of four people can play a game for £21.99 or two games for £38.99. Add £3 per person for a burger meal in the Beach Road Cafe Bar inspired by the sun bleached, chilled-out beach vibe of Bondi. WHAT TO WEAR: Bowling shoes are provided. TOP TIP: There is an Odeon cinema just next door. So you can check out a film after your game. WHAT ELSE: At Tenpin Swansea there’s also an amusements arcade where you can try to win a prise on the claw machines, or, if you like, you can just chill out watching Sky Sports in the fully licensed bar or playing pool on the three American pool tables. ABOUT THE AUTHOR: Richard Thomas is the author of Para-News and Sci-Fi Worlds. To buy signed copies of his books visit www.richardthomas.com. 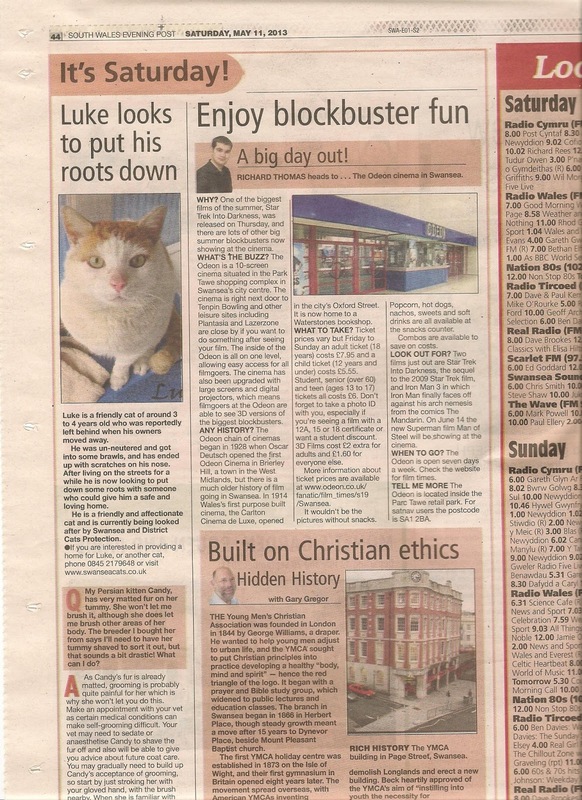 Below is my “Big Day Out” column from the Saturday, May 11, 2013, Swansea edition of the South Wales Evening Post. WHY? One of the biggest films of the summer, Star Trek Into Darkness, was realised on Thursday and there are lots of other big summer blockbusters now showing at the cinema. WHAT’S THE BUZZ? The Odeon is a 10 screen cinema situated in the Park Tawe shopping complex in Swansea’s city centre. The cinema is right next door to Tenpin Bowling and other leisure sites including Plantasia and Lazerzone are close by if you want to do something after seeing your film. The inside of the Odeon is all on one level, allowing easy access for all filmgoers. The cinema has also been upgraded with large screens and digital projectors, which means filmgoers at the Odeon are able to see 3D versions of the biggest blockbusters. ANY HISTORY? The Odeon chain of cinemas began in 1928 when Oscar Deutsch opened the first Odeon Cinema in Brierley Hill, a town in the West Midlands, but there is a much older history of film going in Swansea. In 1914 Wales' first purpose built cinema, the Carlton Cinema de Luxe, opened in the city’s Oxford Street. It is now home to a Waterstones bookshop. WHAT TO TAKE? Ticket prices vary but Friday to Sunday an adult ticket (18 years) costs £7.95 and a child ticket (12 years and under) costs £5.55. Student, senior (over 60) and teen (ages 13 to 17) tickets all costs £6. Don’t forget to bring a photo ID with you, especially if your seeing a film with a 12A, 15 or 18 certificate or want a student discount. 3D Films cost £2 extra for adults and £1.60 for everyone else. More information about ticket prices are available at www.odeon.co.uk/fanatic/film_times/s19/Swansea. It wouldn't be the pictures without snacks. Popcorn, hot dogs, nachos, sweets and soft drinks are all available at the cinema’s snacks counter. Combos are available to save on costs. LOOK OUT FOR? Two films just out are Star Trek Into Darkness the sequel to the 2009 Star Trek film and Iron Man 3 where Iron Man finally faces off against his arch nemesis from the comics The Mandarin. On June 14 the new Superman film Man of Steel will be showing at the cinema. WHEN TO GO? The Odeon is open seven days a week. Check the website for film times. TELL ME MORE: The Odeon is located inside the Parc Tawe retail park. For sat nav users the postcode is SA1 2BA. To book tickets phone 0871 22 44 007. Below is my “Big Day Out” column from the Saturday, May 5, 2013, Swansea edition of the South Wales Evening Post. RICHARD THOMAS heads to the Gower Heritage Centre. WHY? Set in the heart of the Gower Peninsula, the Gower Heritage Centre is a fun way to spend your day with a wide range of craft displays and activities to enjoy. In addition, the centre also holds several special annual events. This weekend there is a cheeses and cider festival at the centre. WHAT’S THE BUZZ? The Gower Heritage Centre is a visitor attraction and rural life museum based around a working 12th century water-mill. Located only a 15 minuet walk from the breath taking Three Cliffs Bay, the centre offers fun activities for all the family, including craft shops and craft activities. ANY HISTORY? A water powered corn and saw mill was established on the site sometime during the 12th century, with the first written references to the water-mill appearing in government records from about 1300 onwards. In 1990 the Gower Heritage Centre was opened, the 12th century mill was renovated, and experienced craftspeople took up residence on site. LOOK OUT FOR? You can watch the craftspeople resident at the centre at work and visit their stores as you go round. Some of the gifts available to buy at the centre include various items in different turned woods made by woodturner John De Filippo, puppets and puppet making kits at Poppet Puppets, as well as paintings and artwork by Cheryl Firths. Other special items available to buy at the centre include some amazing driftwood gifts and hand made candles, as well as a range of garden furniture made at the Mill. There’s also an old fashioned games arcade, as well as a sandpit area, adventure playground, soft play area, and tractor play area. There’s even an animal farm with ducks, baby rabbits, guinea pigs, goats, sheep, horses and other animals. And, if all that wasn’t enough to see, the centre is also home to the smallest cinema in Wales, the La Charrette. WHAT TO TAKE? There is a fee of £5.95 for adults and £4.95 for children 2 years old and up. Seniors and disabled visitors only pay £4.95 and you can opt to buy a family ticket which covers 2 adults and 2 children for £2, or, a supersaver family ticket which covers two adults and up to four children for £25. Meals are available in the centre’s fabulous Tea Rooms. Also, don’t forget to bring a camera with you to take some photos. WHEN TO GO? The centre is open from 10am to 5pm all week. On May 11 and 12, the centre is holding its annual Cheeses and Cider Weekend, where visitors can come and try a wide variety of Welsh ciders and cheeses. There will also be live music, plus a bar, BBQ, cider press demos and lots more to check out. TELL ME MORE: For sat-nav users the full address and postcode is: Gower Heritage Centre, Parkmill, Gower, Swansea, SA3 2EH. 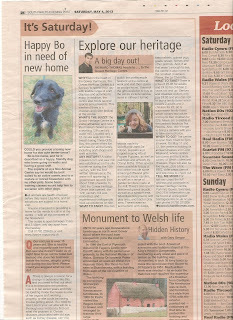 More information can be found at www.gowerheritagecentre.co.uk or you can phone 01792 371206.